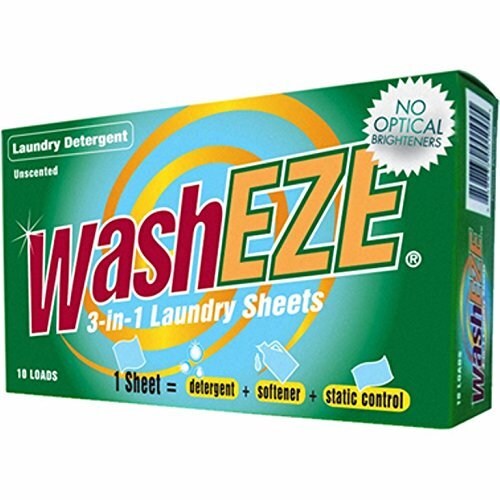 WashEZE is a detergent, fabric softener, and a dryer sheet, all in one! One WashEZE sheet does one load of laundry. Directions: 1. Add WashEZE to your laundry in the washing machine 2. Transfer WashEZE sheet and clothes into the dryer 3. Laundry complete! More about WashEZE: WashEZE is a highly concentrated laundry detergent embeded into this sheet. It is laboratory-proven to clean as well as the leading detergents! WashEZE's proprietary formula also includes softener / anti-static ingredients This liquid is dried in enormous ovens to create a "dry" laundry sheet that can't make a mess while traveling, or in your laundry room! All elements of a traditional laundry detergent, softener, and static control in this All-in-One sheet! THE LAUNDRY SOLUTION - Unscented Detergent, fabric softener, and static control all in one! Proven Great Cleaning Ability! COLLEGE FRIENDLY - Each sheet does one full load of laundry. The Ideal Solution for College Students, RV Use, Campers, Travelers, and Busy Moms! MILITARY FRIENDLY - Used by the US Military for over 10 years. Unscented with no Optical Brighteners - great for camouflage! MADE IN THE USA! HE COMPATIBLE - Works with all types of laundry machines and dryers. Perfect for Front Loaders! GREAT FOR TRAVEL - Travel friendly, can even be used without a washing machine. Airline Approved! If you have any questions about this product by WashEZE, contact us by completing and submitting the form below. If you are looking for a specif part number, please include it with your message.